You may have noticed the banner on our website of the hard-hatted bloke soaking up the sun in the pool lounger, clearly living the dream. Well, it looks like tax rebates for contractors are part of a wave of good times in the construction industry. In fact, with recent news of a construction pay rise (particularly for contractors) exceeding other industries, “living the dream” really seems to be the norm for all construction contractors. The pressures to meet demand and achieve productivity goals is driving an increased use of temporary and contract employees. 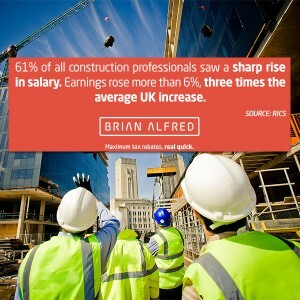 61% of construction professionals surveyed reported sharp wage rises. Though some worry about labour shortages and drops in skill sets, the potential clearly shows a confidence in the positives the industry presents. Construction News reported recently that the sector saw activity growth in Q1 for the 12th consecutive quarter. Coupled with the strong pay opportunities and desire of firms to meet the needs of the Millennial era candidate (flexibility, allowances, etc. ), everything seems to be throwing shine on construction contracting. Tax rebates, sector growth & construction pay rise. Nice one, Brian.